Here’s something I learned during my month away from the blog: the Rite Aid at Grand Central does indeed sell OPKs, and cheaper than my local Duane Reade. I learned this on Day Infinity of peeing-on-sticks (CD Infinity + 13). I had run out on the day before and assumed there would be none at the GCT store, a strange warren with much more in the way of Pringles than of anything drug-like. I catch the 7:12 train from GCT in the mornings, and even at that hour, a line of dazed people grasping Powerade and Funyuns clots in the hair-care aisle. The last thing I bought there was Scotch Tape in a donut-shaped dispenser. So on CD (Infinity – 1)+13, when I realized it was time to traipse merrily along to the meeting of my Community Garden Governing Board (how I got suckered into that one is another story), I instead ran in the opposite direction, waited in line 4-EVAH at Duane Reade, and arrived late at the meeting, panting and with open wounds on my feet from flip-flops that aren’t made for speed. That night I opened the box and made sure to leave one test out on the table, so I wouldn’t forget to take it with me to school, where there are no drugstores for miles. I’m sure you know where this is going. Yadda-yadda happy ending, although the message on the receipt still strikes me as slightly creepy. Rite Aid is even more excited about peeing on sticks than I am!! 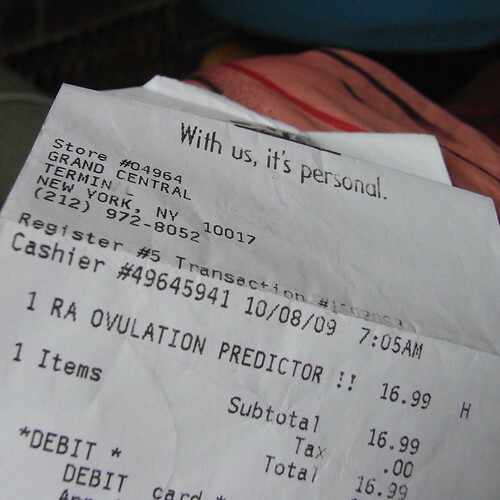 RA OVULATION PREDICTOR!! RA! RA! The test was negative, of course. Categories: Micturition Chronicles, The Other O, The Waiting Game | Permalink. I have to say, it's really the exclamation marks that make it. So true. This post didn't come out quite right, so I'm glad you still noticed them. Yeah, that Rite Aid reciept is a little on the odd side.